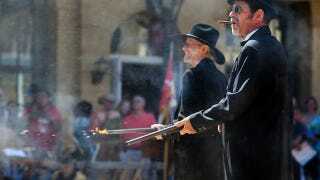 Religion and gunfire—it worked for the Boondock Saints, but one man, Porter Rockwell, made this combination a reality during the 1800s. An ardent Mormon, Rockwell resorted to violent means to defend his leaders and people, but the gunslinger also served as a U.S. Marshal and displayed a generous soft side. A faithful member of the Mormon religion his entire life, Orrin Porter Rockwell clung near to Joseph Smith, acting as Smith’s personal protector and friend. Baptized into the Mormon faith at the age of sixteen and noted to be one of the first members of the church, Porter Rockwell displayed a zealous religious fervor that he often expressed with gunfire. Film buffs might see Porter Rockwell as an individual akin to Joaquin Phoenix’s character Freddie Quell in the 2012 movie The Master, who defended Lancaster Dodd and The Cause with a radical fervor. Porter forcefully protected Smith and Mormon rights, making him the enemy of a number of groups who called for the expulsion of Mormons from Missouri and those who tried to quell Mormon actives in Utah. On Christmas of 1843, Joseph Smith “blessed” Porter Rockwell, stating that the man would not be harmed by “bullet or blade” as long as he did not cut his hair. This statement bore a stark resemblance to the Israelite story of Samson, and led Rockwell to braid his hair over time. Porter Rockwell went against the words of Smith and cut his hair, at least according to a one piece of Mormon lore. Upon seeing an elderly woman stricken with typhoid fever, an illness that left the woman bald, Rockwell cut his locks so they could be fashioned into a wig for the lady. Rockwell is also humorously remembered for his unusual war cry—the gunslinger often screamed the word “wheat” as he launched into battle. After the Great Mormon Migration, Porter Rockwell served as a Deputy Marshal of the State of Deseret during Mormon attempts at secession under Brigham Young, and later as a U.S. Marshal and Deputy Marshal in Salt Lake City. Rockwell did participate in 1857 war between the United States and Mormon settlers in modern-day Utah—Brigham Young sent Rockwell to slow down and annoy expeditions of troops sent by the United States. Mormon tensions persistently ran high in Missouri and Illinois during the 1840s, with Porter contributing to the turmoil thanks to his ties to an attempted assassination the Mormon enemy Lilburn Boggs, a former governor of Missouri. During his time in the highest office in the state of Missouri, Boggs issued Missouri Executive Order 44, which called for the removal of Mormons from the state. Whether Porter fired the gun used in the assassination attempt is debated, but Rockwell served nearly a year in jail awaiting trial before his release. After the death of Joseph Smith by shooting in 1844, Porter Rockwell served as personal bodyguard to the new leader of the Mormon faith, Brigham Young. Controversy continued to follow Rockwell, with the gunslinger accused of a revenge killing shortly after being deputized. Porter shot and killed Frank Worrell, a local vagabond who also happened to be the militia member in charge of protecting Joseph Smith on the day of Smith's murder. The most damning incident involving Rockwell concerns the death of two Californian settlers tasked with taking supplies to U.S. troops stationed in the Utah Territory during the Winter of 1857. Porter and several other men opened fire on the settlers, with John and William Aiken shot and killed in the ambush. Porter Rockwell would spend the rest of his life, nearly twenty years, awaiting trial and punishment for the Aiken murders. The Salt Lake Tribune cast the deaths of over a hundred men into the hands Porter Rockwell, but without a detailed accounting. James Coates, the author of In Mormon Circles, pegs the number a little lower, at fifty to one hundred. Life did not consist solely of violent shoot-outs for Rockwell. He owned and operated a hotel and brewery in Salt Lake Valley area. The building continues to carry Rockwell’s name and now serves as a restaurant. Despite this violent life, Rockwell received a peaceful death, passing away due to natural causes in his mid-60s in his adopted hometown of Salt Lake City. Top image via Robert Bouse-Baker/Flickr. The original copy of the photograph of Porter Rockwell shown is now held in the Harold B. Library at Brigham Young University, and the image is within the PD. Image of Porter's Place is via Jotor/Flickr and is within CC. YouTube clip is from the 2010 documentary Stories From the Life of Porter Rockwell.